Entering the next-to-last week of the regular season, 10 of the 16 spots in the Calder Cup Playoffs are still up for grabs. In the Eastern Conference, Manchester and Springfield are in but the remaining six berths are yet to be clinched, with nine points separating seven teams between third and ninth place. Over in the Western Conference, Texas, Grand Rapids, Toronto and Chicago are postseason-bound, but nine teams remain mathematically in contention for the last four invites, highlighted by a logjam among seventh-place Oklahoma City (77 points), eighth-place Rochester (76), ninth-place Rockford (75) and 10th-place Charlotte (75). Three of the six division titles have already been secured, with Springfield, Texas and Toronto all repeating their first-place finishes from a year ago. Saturday featured some of the most memorable, dramatic finishes of the season in the AHL, with three different games seeing teams stage epic last-minute comebacks. In Toronto, the Marlies needed just a single point against Rochester to secure the North Division title, and took a 3-0 lead into the third period at Ricoh Coliseum against a Rochester club desperate to stay in the playoff hunt. Behind a natural hat trick from Tim Schaller, the Americans cut the deficit to 3-1 early in the period, got within 3-2 with 3:20 left in regulation and tied things up with 58 seconds to play. But before the Marlies could take solace in a trip to overtime that would still earn them the division crown, Phil Varone scored with 43 seconds left, giving Rochester a remarkable 4-3 victory. While Rochester was stunning Toronto, the Manchester Monarchs were orchestrating their own comeback against Portland. Trailing 3-1 late in the third period, the Monarchs got goals from Jordan Weal — his second and third of the game — at 18:17 and 19:29 to force overtime, where Manchester survived a two-minute Portland power play before Sean Backman scored the game-winner for the Monarchs 3:49 in. Later on Saturday evening in Syracuse, the Utica Comets carried a 5-2 lead over the host Crunch into the final two minutes of regulation. With goaltender Kristers Gudlevskis on the bench for an extra attacker, Syracuse made it 5-3 on a goal by Vladislav Namestnikov at 18:21 before Jonathan Marchessault scored two goals 15 seconds apart to tie the game at 5-5. Capping the comeback, Brett Connolly scored 2:36 into overtime to give the Crunch the amazing 6-5 win. In helping their teams to comeback wins on Saturday, Tim Schaller and Jordan Weal had two of the eight hat tricks recorded over the weekend by AHL players. 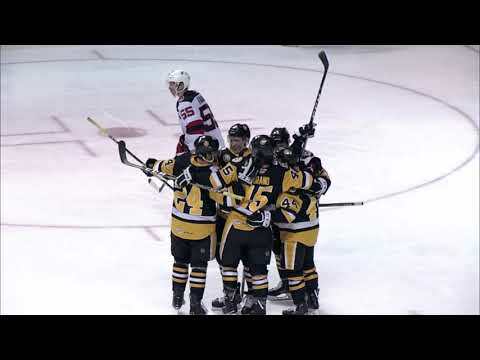 Portland’s Lucas Lessio scored all three Pirates goals in their 4-3 overtime loss to Weal’s Manchester Monarchs on Saturday afternoon; Lessio and Weal became the first opponents to have hat tricks in the same AHL game since Mar. 21, 2009, when Syracuse’s Alexandre Picard scored four goals and Albany’s Pat Dwyer had three in the Crunch’s 5-4 win over the River Rats. Also Saturday, Norfolk’s Emerson Etem paced the Admirals to a 6-3 win in Binghamton with his first career hat trick. In Friday’s action, Jack Skille returned to the Springfield lineup after missing eight games due to injury and picked up four goals and an assist in the Falcons’ wild 8-7 overtime win at St. John’s. It was Skille’s first AHL hat trick since Mar. 9, 2008, when he was with Rockford. Corban Knight scored three times to help Abbotsford past Rockford, 6-3, and Brett Ritchie set a Texas franchise record with four goals and tied the team mark with five points in a 5-1 win over Lake Erie. On Sunday, Jason Akeson notched a hat trick for Adirondack in the Phantoms’ 4-3 victory over Albany. Andrew Campbell finally got the call he’d been waiting six years for, and the veteran defenseman made his National Hockey League debut with the Los Angeles Kings in a Hockey Night in Canada game at Vancouver on Saturday night. Campbell, 26, played 413 AHL games with the Manchester Monarchs before getting into his first NHL game. A 2008 third-round draft choice by the Kings, Campbell is the Monarchs’ all-time franchise leader in games played. A pair of shootout wins over Oklahoma City two weekends ago gave Charlotte a four-point lead over the Barons in the race for the final playoff spot in the Western Conference. Given the chance to turn the tables, the Barons were all too happy to oblige. With 1-0 and 6-4 wins at the Cox Convention Center this past weekend, Oklahoma City reclaimed the seventh spot in the West and dropped Charlotte back to 10th. On Saturday, C.J. Stretch scored the game’s only goal and Richard Bachman made 31 saves for the Barons; on Sunday, Oklahoma City scored four times on 27 shots in the second period but needed Ryan Hamilton‘s tiebreaking goal with 35 seconds left in the third to grab a crucial regulation victory. Charlotte, which won 12 of 16 games during March, begins April on a three-game losing streak. After picking up Hartford’s first two shutouts of the season on Mar. 29 and 30, David LeNeveu continued his scoreless run in a 2-0 win at Manchester on Friday night, blanking the Monarchs on 37 saves. LeNeveu’s bid for a fourth consecutive shutout ended in the first period vs. Providence on Saturday, but he finished with 26 saves on 27 shots as the Wolf Pack edged the Bruins in a shootout, 2-1. LeNeveu went 200 minutes and 4 seconds without allowing a goal. Finishing the weekend with 30 saves in a 3-2 win over Norfolk on Sunday, LeNeveu has now won five straight decisions for Hartford while allowing three goals on 149 shots (0.59, .980) over that span. Peter Mannino began the week being named the CCM/AHL Goaltender of the Month for March, then kept on rolling with back-to-back shutouts over the weekend. Mannino made 17 saves in a 3-0 win over Bridgeport on Friday night before a 25-save performance in a big 1-0 overtime victory over Albany on Saturday that temporarily moved the Penguins into first place in the East Division. Mannino, who also had consecutive shutouts on Mar. 15 and Mar. 21, has allowed two goals or fewer in each of his 13 appearances since rejoining the Penguins on Feb. 28. He is 9-2-1 with a 0.95 GAA and a .958 save percentage over that span. Behind the goaltending of Mannino, Jeff Deslauriers and Eric Hartzell this season, the Penguins have allowed a league-low 2.42 goals per game. They are bidding to finish first in the AHL in goals against for the third time in four seasons under head coach John Hynes. The Texas Stars have won nine straight games, tied for the longest winning streak in the AHL this season, and have surged to the top of the overall league standings with a 45-17-3-6 record and 99 points. Texas’s winning streak began Mar. 15 with a 3-0 win at Chicago, and by a statistical quirk remains intact despite a 5-4 shootout loss in San Antonio on Mar. 27. That game was the completion of a game that had been suspended due to unsafe ice conditions at the AT&T Center, and by rule all stats count for the day on which the game began (Mar. 1). The Stars are also 15-1-0-2 in their last 18 games, and have earned points in 21 of their last 23 (17-2-1-3). Balloting has been completed for the AHL’s season awards, and winners will be announced beginning this week. Announcements will begin with the 2013-14 AHL All-Rookie Team on Wednesday and the 2013-14 First and Second AHL All-Star Teams on Thursday. Other player honors include the Les Cunningham Award (MVP), the Dudley (Red) Garrett Memorial Award (top rookie), the Eddie Shore Award (top defenseman), the Aldege “Baz” Bastien Award (top goalie), the Louis A.R. Pieri Award (top coach), the Fred T. Hunt Memorial Award (sportsmanship, determination, dedication to hockey) and the Yanick Dupré Memorial Award (Man of the Year). Voting for the AHL’s annual player awards is done by coaches, players and media members from all 30 league cities. Congratulations to AHL call-ups Patrik Nemeth, Jonathan Racine, Andrew Campbell, Scott Mayfield, Adam Payerl, John Gibson and Michael Hutchinson, who all made their National Hockey League debuts in the last week. For the 2013-14 season, a total of 120 AHL players have now made their NHL debuts.